RYKÄ Fit Members: Refer Your Students and Earn! Think you know the benefits of boxing? “Think” again. Boxing is an all-around workout that tones the entire body with one jab, strengthens the core, enhances cardiovascular conditioning, helps complete crossword puzzles – wait, what? Boxing enhances kinesthetic awareness and proprioception in a big way, Steve says. Learning to control the dynamics of energy expenditure – not go hard or go home – creates a sustainable pattern of thinking and moving. Boxing builds a more-stable mindset during and outside of movement. The SCW Boxing Certification with Steve Feinberg is available at all eight MANIA® conferences across the country. To find one near you, visit www.scwfit.com/MANIA. This Certification also can be taken online – www.scwfit.com/CERTIFICATIONS – which includes the opportunity to attend a live Certification for free at a MANIA® within a year. BollyX, the Bollywood Workout, is proud to announce the launch of BollyX On Demand: The hottest Bollywood workout program is now available from the comfort of your home. You now can stream and workout to top Bollywood and Bhangra hits right from your living room. Regardless of whether or not you have dance experience, BollyX On Demand caters to all fitness levels, and everyone is guaranteed to have a great time! BollyX is a Bollywood-inspired dance-fitness program that combines dynamic choreography with the hottest music from around the world. Its cardio workout cycles between higher- and lower-intensity dance sequences to get you moving, sweating and motivated. At the very core of a BollyX workout is the inspiration it draws from the music and dance of Bollywood, the film industry of India. It embodies the infectious energy, expression and movement of Bollywood and aims to expand the reach of fitness to more people worldwide. In April of 2017, BollyX started rolling out invitations to the beta version of BollyX on Demand, and the program already has garnered well over a thousand users within the first month with demand continuing to grow nation and worldwide. BollyX On Demand aims to target those who are looking to join in on the Bollywood fun but may not have a class local to them, as well as those who are looking for an extra workout to add to their regime. While there are over 300 BollyX classes weekly in over 35 states, including Canada, the desire for classes is growing so quickly that BollyX wanted a way to invite everyone to be able to experience the Bollywood workout. BollyX On Demand is currently free for everyone to sign up. Every user will have access to three workouts so they can start working out right away, and more workouts can be unlocked by referring friends to the program. The BollyX program current holds over 200 songs of choreography, which can be configured into an unlimited number of workouts, with songs that cater to all tastes and styles. In addition to the release of BollyX On Demand, BollyX also attended its first overseas conference this year at FIBO, the world’s largest fitness conference. BollyX also presenters at SCW MANIA® conventions, the nation’s largest fitness conference, as well as IDEA World 2017 and canfitpro. To find BollyX at a MANIA® near you, visit www.scwfit.com/MANIA. Come to any of our eight MANIA® conferences to experience the BollyX Bollywood Dance Workout LIVE! To find out more about BollyX On Demand, click on www.bollyx.com/ondemand. You know the importance of proper footwear – your livelihood depends on it. You also know the importance of good footwear is something your students may not always understand. 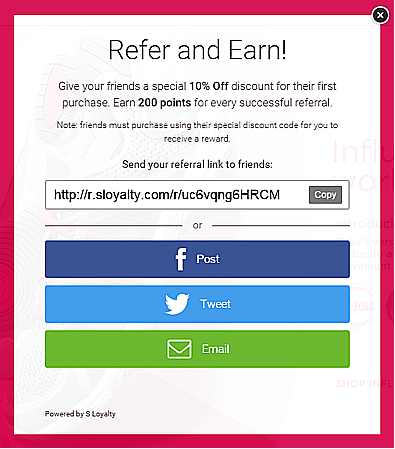 Through the Rykä Fit referral program, your students will have access to our knowledgeable service team to help them make the right shoe choice for their activity and foot type, and they will receive special, student discount pricing, which includes a minimum of 15% off + rewards points. As an added bonus, you will be eligible for $10 in FIT Rewards points when one of your referrals makes a purchase. It’s a win-win! Students will receive an email confirmation with a coupon code for an extra 20% discount on their first purchase on rykafit.com. Not a member yet yourself? Sign up today and start earning rewards! New and existing studio owners who are looking for a small business loan but don’t want to leverage their homes as they grow their companies may be eligible for a unique loan that uses business assets as collateral. The Small Business Administration (SBA) Express Loan is designed to provide working capital ranging from $20,000 up to $150,000 for start-up and existing businesses. “This main purpose of this government-backed loan is to provide the funds necessary to support the company until the business generates positive cash flow,” said Paul Bosley, a MANIA® Presenter and the owner of Healthclubexperts.com dba Business Finance Depot, which specializes in providing financing for new and existing business owners. The SBA loan request amount is capped at $150,000 to limit the risk, therefore; only business assets and not real estate assets are used to collateralize the SBA Express Loan. The main approval requirements are good personal credit and some liquid assets. The interest rate for this SBA loan is calculated starting with the prime rate published in the Wall Street Journal, which is currently 4%. The bank charges a risk-premium ranging from 2.75% to 4.75%, so depending on the loan amount, the interest rate will range from 6.75% to 8.75%. The larger the loan, the lower the interest rate. For example, the interest rate on a $25,000 loan is 8.75% while a $150,000 loan has an interest rate of 6.75%. This is a variable rate, so it will change when the Fed raises or lowers the rates. The most recent .25% rate increase raised the SBA loan payments on a $150K loan about $18.00 per month. All SBA loans require closing costs, which typically range from 3% to 5% of the loan amount. Again, the lower the loan, the higher the closing costs and vice versa. The loan’s repayment term is 10 years, and there is no prepayment penalty. “So, if the business is profitable, the loan can be prepaid to save interest expense,” said Paul. For example, an SBA loan has a 6.75% interest rate. Assuming the fitness center operates at a 15% profit margin, the club owner is using OPM at a cost of less than half of his/her anticipated return on capital! New or existing club owners interested in $25,000 can get an SBA loan that requires no collateral. The $25,000 SBA Working Capital Express Loan is completely unsecured – there are no business or personal assets required to be used as collateral. It is a quick process that can take less than a month to close if the business owner focuses on the required forms. To see Paul at MANIA®, check out www.scwfit.com/ATLANTA and www.scwfit.com/DALLAS. SCW Fitness Education offers business lectures and certifications throughout each of its eight MANIA® conferences across the country. Check out www.scwfit.com/MANIA for more information. Moringa is the part of the Moringa Oleifera plant, which is loaded with oodles of health benefits. Be it powder, seeds, leaves, flowers, barks, roots, or fruits; all genera of the plant are consumed to feed the body with nutritious qualities. This super beneficial plant, which is native to Asia and Africa, is termed the ‘Never Die Tree’. The plant has been used in medications for thousands of years because it’s rich in antioxidants and loaded with plenty of nutrients. These nutrients are powerful enough to fight against severe diseases such as HIV, cancer, and kidney disease. It also helps control blood pressure, inflammation, blood sugar levels, cholesterol and much more. This is why it is considered to be one of the most nutrient-rich plants on Earth. In the world of nutrition, Moringa has made a grand comeback as a Superfood. In fact, people now are recognizing Moringa as the most nutritious food item. Another moniker for the plant: “The Miracle Tree’. Moringa leaves contain low fat (1.4 grams per 100 grams) and a very low amount of cholesterol. It is intensely loaded with other main nutrients such as protein, carbohydrates, dietary fibers, vitamin A, vitamin C, zinc, sodium, iron, sodium, calcium, potassium, magnesium, phosphorus, and folates. It is believed that no other food item contains this high proportion of all the nutrients. The proportion of protein, iron, calcium, and magnesium, which are highly responsible for boosting metabolism in the body, is quite high in the plant. Ingesting the Moringa could rejuvenate you and make you feel energized throughout the day. Being rich in antioxidants and omega-3 fatty acids, Moringa not only improves immunity but also reduces inflammation, which leads to the production of healthy cells. Eventually, skin issues get eliminated and its glow is enhanced. It also is proven to be the best remedy to fight alleviated fine lines and wrinkles on the face. Starting a day by consuming a delicious green smoothie of Moringa would be a great savior in aging. Approximately 25% of protein content is found in the leaves of Moringa, which is considered high in any plant. Essential amino acids present in the plant is the best way to promote muscle growth. To maintain the health of bowels, one of the most essential nutrients is dietary fiber, which is highly present in the Moringa. Along with fiber, Moringa oil has the power to detoxify harmful toxins from the gut. This detoxification allows bowels to absorb healthy nutrients through healthy foods. The leaves of Moringa contain 31% of the fiber, which not only enhances the digestive system but also makes you feel fuller and protracted. Moringa is comprised of an abundance proportion of vitamin A and beta carotene, which are considered necessary for eye health. Moringa contains 33% of vitamin A and is considered the best plant to contribute to healthy vision. Incorporating it into your diet at least once a day will tremendously lower your risk of decreased eyesight. One of the most important nutrients for bone health is vitamin K.
The highest proportion of vitamin K, one of the most important nutrients for bone health, is present in Moringa leaves. This tremendous volume of vitamin K maintains the health of bones and contributes in regulating joints. The perks to this special plant are numerous. Upgrade your list of Superfoods with Moringa and relish its many benefits. Come to a MANIA® near you to experience the plethora of nutrition sessions offered! About the author: Henry Veno is a fitness and a healthy diet addict who blogs at www.TheDietSuggestions.com.